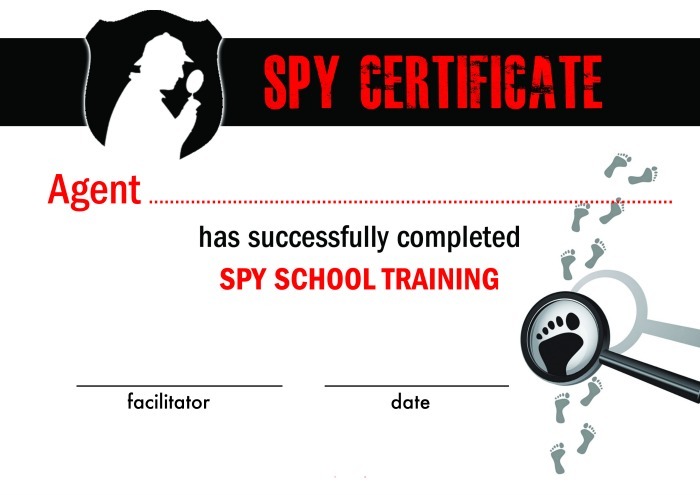 Beat boredom this summer by doing a spy school themed summer camp! A DIY summer camp at home is a great way to encourage fun and play without having to spend a lot of money or time prepping. Kids can complete spy school training using these free spy school printables and simple crafts and activities. I spy fun times ahead with these DIY secret spy school activities! No one likes to have to adhere to a strict schedule in the summer so we’ve made it easy for you to mix and match these crafts and activities each day to fit your family, neighborhood, troop or school group. Every spy school needs to provide their trainees with the proper credentials. 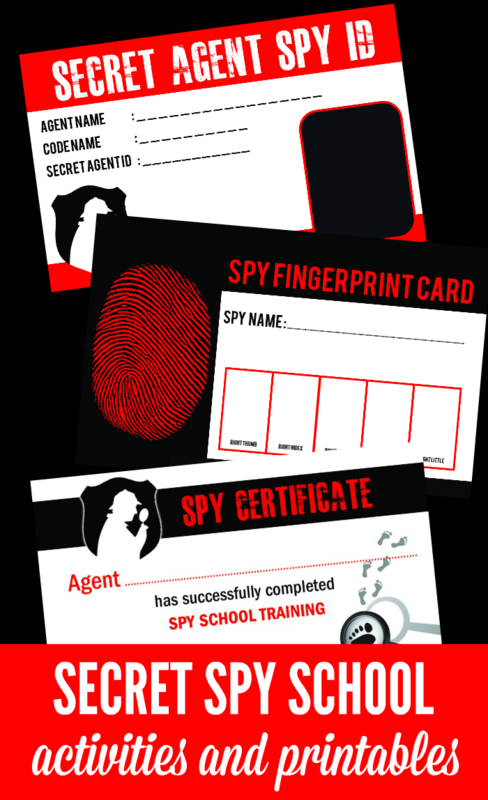 Start spy school off right by printing out free printable Spy ID Cards for all of your spy school students. Let them come up with their official cover or spy name and take a photo of them for their badges. Fingerprint each child using the free printable Spy Fingerprint Card and then laminate both (here is an affiliate link for the laminator we love) for their confidential files. Then present them with their spy school certificate at the end of the week. 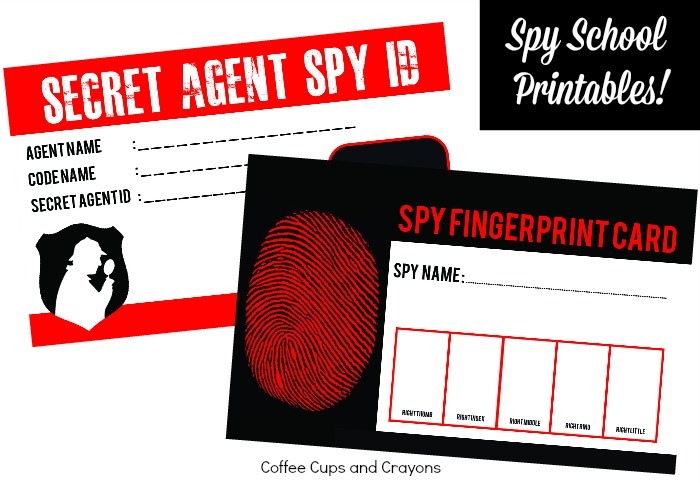 We’ve created a complete set of free spy school printables for you to use. Download them all to make the experience complete! Crack the code. Use the secret decoder printable (coming this week!) to show kids how to write and decipher a secret code. Point the star (letter A) to any letter to create a new code. Practice reading and writing spy notes to be ready for a spy mission. Spy obstacle course. Set up a string obstacle course for your spies-in-training to navigate their way through. You can use string like Hands on: as we grow did in her spider web activity. Marshmallow shooters. Spies need to be able to think quickly and act fast. Show kids how to make their own marshmallow shooters and use them to create a diversion. Flying marshmallows is sure to distract a target and allow them to get to their goal. Invisible ink messages. Use lemon juice and an iron to write and read invisible messages. Kids can write messages to each other and hide them for their contact to find. Then a grown up can help them make them appear. Master the meltdown. Send the spies on a mission to save the good guys or a special treasure from a deep freeze. Prep this one the night before by freezing small toys or treasures in ice and then giving the kids water squirters to use to free them. Dust for fingerprints. Find out if spies have been in your house or school by dusting for fingerprints. Use a kit like this one to dust and analyze fingerprints. Walk the wire. Use a piece of lumber or painter’s tape to create a “wire” for the spies to practice walking on. Once they get good at it you can throw pom poms at them to try to dodge as they walk. Pipe Cleaner Disguises. Spies need to be able to master the art of disguise. Give kids pipe cleaners to create disguises to help slip by the enemy. I spy. Observation skills are one of the keys to a spy’s success. Download free printable I Spy games from The Pleasantest Thing for kids to use to practice spotting clues. Avoid the laser. Set up a sprinkler in the backyard and have the kids try to run through without getting zapped by the lasers aka water! Make a magnifying glass. Spies need to be able to use whatever is available to get the job done. Use a tutorial from Science Sparks to make your own magnifying glass. Stop the explosion. Oh no. There is about to be an explosion unless the secret agents can remove all the wires (rubber bands) from the bomb (pine cone)! Set up a fine motor activity like this one from The Imagination Tree and have your spies remove all the rubber bands and save the day. This post is part of a HUGE resource for you! 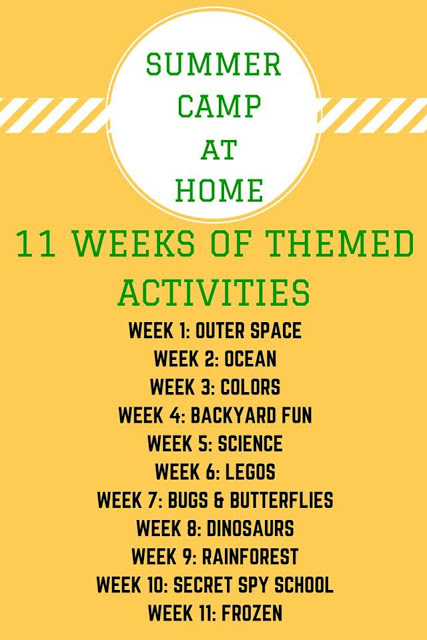 We’re joining 10 other bloggers in 11 weeks of themed Summer Camp at Home activities. These themed activities will fill the weeks of summer with learning, fun, and play. And for even more fun we have a camping themed DIY summer camp too! How fun! I love the activities to go with it! My daughter has been running around the house with binoculars lately pretending she’s a spy so this is very timely for us, lol! He he! That is adorable! My kids would think I was the coolest mom ever with this summer camp at home! LOVE it!! My kids are too much into cycling but I think mental/mind games are equally important to increase IQ. I love the concept of solving puzzle through these spy activities. I love the concept of solving puzzle through these spy activities. i love the DIY Summer Camp at Home program! thank you! What an awesome round-up of activities! I’m loving it (and I know my daughter will, too). The teacher in me is very excited!